Basking Sharks are VERY RARE: Less than 8,000 Breeding Females Left Worldwide: We Need to Find out Scientific Facts about them so that we can PROTECT the ones that are left. 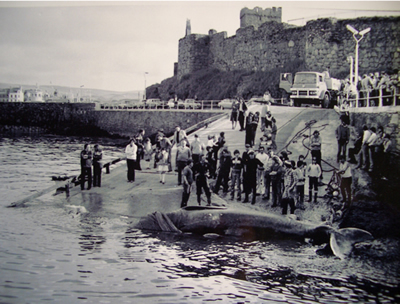 When MBSW was started in 2004, little was known about the basking sharks seen in Manx waters or how they mixed with other basking shark populations. Why are Basking Sharks Rare? Hundreds of thousands of basking sharks were killed for their liver oil and their fins are still used for shark fin soup. 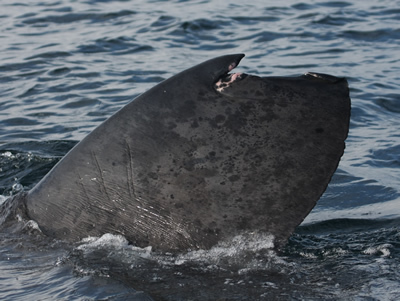 Basking sharks from the small remnant population that is left are accidentally caught in fishing nets and injured by being hit by boats at the surface. Why do we need to study Basking Sharks? Marine Conservation planners need to know as much about basking sharks as possible in order to make sensible, informed wildlife planning conservation decisions. Q1. How many basking sharks are there in the whole world and how many of them frequent British waters? Q2. Where do basking sharks go when they leave British surface waters? Q3. Are there different schools of basking sharks around the world or are they all global travellers? How do we find out scientific facts about basking sharks when they are only seen at the sea surface for a few weeks a year? Scientists study the DNA of basking sharks from around the world and compare this information with what scientists have found out by satellite tagging them. It is hard to study basking sharks because they are only seen at the sea surface for a few weeks a year. Manx Basking Shark Watch is collaborating with scientists from top universities in order to produce the most valuable scientific information possible.